Infinix Hot 4 Pro Gsmarena Review, Specifications and Price in Nigeria: The Infinix Hot 4 Pro, code named X556, is one of the variants of the Hot 4, the others being the base model Hot 4, and the Hot 4 Lite. 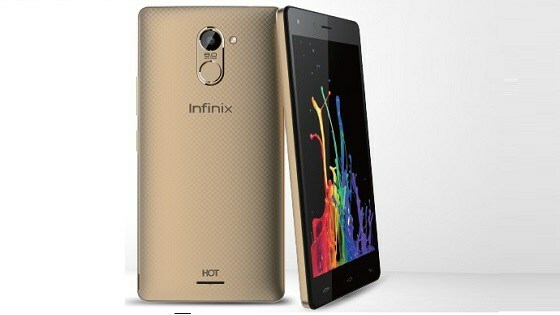 It is a member of the Hot Series which has held spectacular midrange devices like the Infinix Hot 2 and the Hot 3. Like the Hot 4 which didn't make a grand entrance with numerous adverts on social media and mobile enthusiasts were kept in suspense as to it features, the same goes for the Hot 4 Pro. Irrespective of the little or no publicizing it received, this smartphone is still a trending device and most especially, when one begins to recount the best Infinix phones in the Nigerian smartphone market, this stunner would be among. Of the three variants of the Hot 4, this smartphone has the most remarkable specs as it still maintains most of the features of the base model, but comes with improvement in its cameras and supported capacity for an external storage device, a 4G network capability, and is made available in more premuim colours. Unlike the Hot 4 Lite that is a lowered variant of the original Hot 4, the upgraded features of the Hot 4 Pro show that it is a higher variant of the Infinix Hot 4, the mostly highly speced variant of the trio and as would be expected, the most expensive. Given below, is a review of the specifications and price of the Infinix Hot 4 Pro. The Infinix Hot 4 Pro Gsmarena features a 5.5 inch HD display screen with a resolution of 720 by 1280 pixels, and 12 ultra-bright backlight LEDs. With Images and text displayed in vivid details, users of this device can get an enhanced viewing experience. Serving to control and adjust the displays brightness and contrast for a clearer viewing during the day and a gentler display at night, is a smart dynamic calibration. This smartphone has an innovative design that results in a fine silky texture back that gives comfort and an incredible feel when held. It has interchangeable back cases that are available different in colours of mysterious blue, glossy silver, champagne gold and anthracite greygold. This makes for a stylish design and allows users to customize their smartphone to suit their taste based on their preferential colour. The Hot 4 Pro has a weight of 175g and dimension of 152.6*76.2*8.8mm which is heavier and thicker than the Infinix Hot S.
It also features a smart fingerprint scanner to enhance user security instead of using ordinary passwords/patterns that have to be changed when a second party knows it, and third party apps (that usually come with ads) to secure the device from unauthorized users. Other than being used to unlock the device, this scanner can wake dormant apps, and enable privacy control in other applications. According to Infinix Mobility, the scanner is secure, convenient and hassle free. The Hot 4 Pro is powered by a 64 bit quad-core processor with processing speed of 1.3Ghz, and a MT6737 GPU for rendering graphics. It comes with 2GB of RAM like the Hot 4 and has a 16GB internal memory storage which is expandable upto 128GB via microSD, unlike the 32GB limitation of the Hot 4 and Hot 4 Lite. This RAM is quite adequate and with its processor, can aid in multitasking of several apps and result in speedier operations; all done seamlessly. With support for expansion of its internal storage, users can store several apps, games, and files on this device, while worrying less about exhausting the memory storage. The Hot 4 Pro also runs on Infinix customized user Interface, XOS based on Android 6.0 Marshmallow. This operating system features custom themes, smart cleanup, and a freezer app, amongst others. Infinix Mobility claims that the XOS can decrease power consumption by at least 30%, thereby saving up enough battery juice to last you throughout the day. Also featured on this device, is an exclusive noise reduction technology that identifies and reduces unwanted background sounds, and also automatically adjusts the output volume to create an enhanced calling experience. The Hot 4 Pro sports a 13MP back camera with LED flash, five internal lens elements and multiple shooting modes. It also has a 5MP front camera with a soft light flash, ensuring bright images and accurate color are still captured even in low light conditions. At resolutions that are higher than that of the front and back cameras of both its variants, one can expect better images from the Hot 4 Pro and ones with more details captured. Like its variants, the battery capacity of the Infinix Hot 4 Pro is also 4000mAh. This battery has a long standby time of 660 hours, and talk time of 45 hours on 2G and 20 hours on 3G. On full charge, it can last up to two days on medium usage with extra power to spare. There is support for fast charge (5V 2A), as well as efficient power management with the XOS. The Hot 4 Pro has dual SIM functionality with two dedicated SIM slots. It also supports 4G LTE connectivity, resulting in faster download speeds and steadier connectivity when videos are streamed. Other connectivity options of this smartphone include bluetooth, GPS, USB, and WI-FI. Its sensors include proximity, fingerprint, light, E-compass and G-sensors. Infinix Hot 4 Pro price in Nigeria ranges from ₦50,000 to ₦53000 depending on your location in the country and the current exchange rate. The Infinix Hot 4 Pro is available in Nigeria, Kenya, Ghana and some other African countries. The Infinix Hot 4 Pro specs are ones that makes its price not so hard to stomach. The bumped up camera resolution and expandable storage capacity on this variant, with a 4G LTE capability makes it well deserving of the name Pro. There are several mid range devices within the same price range or above, but offer specs that would hardly compete with these. The Hot 4 Pro is a greatly engineered device that is definitely worth its price.